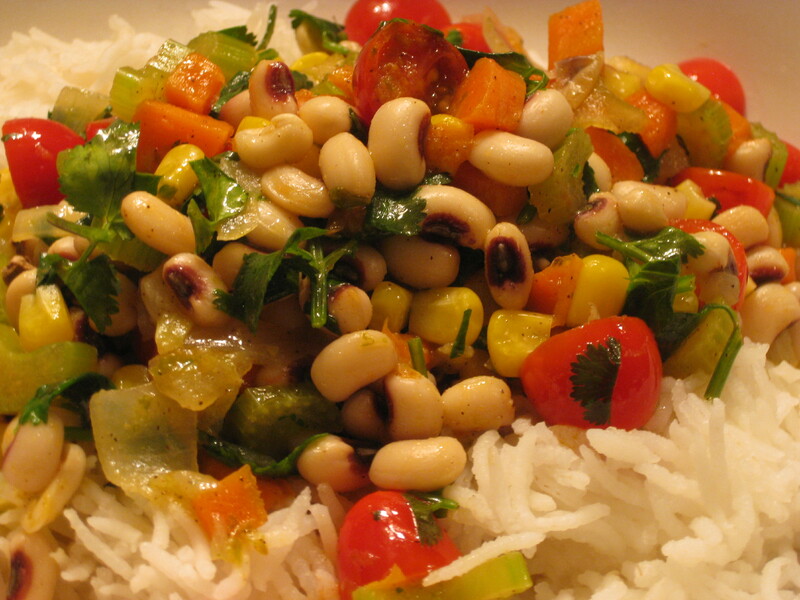 I used fresh black eyed peas for this recipe and cooked them very gently. You can sprout fresh peas and toss them in the salad raw or warm them. Saute until onions are translucent and peas are tender, stirring often. Saute 5 minutes, until garlic and corn are crisp tender. Remove from heat. Toss to coat. Adjust salt and pepper to taste. Serve over rice, salad greens, with crackers, or with toast points. 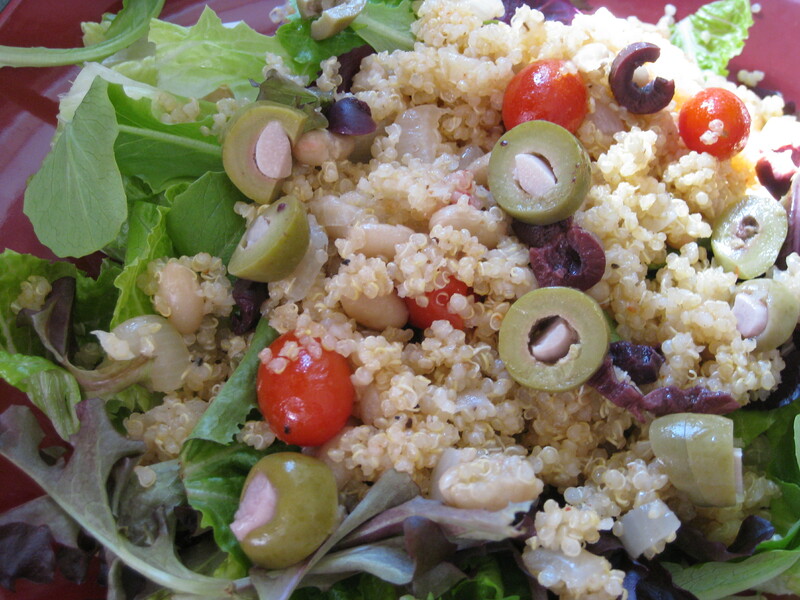 Quinoa is used in many Latin influenced dishes. This is more of a Mediterranean flavor inspired dish. It’s also very quick and easy. It’s a budget friendly dish that would be great to serve at a luncheon. It’s also low fat, high protein, and high fiber. I used garlic stuffed olives! In a large stock pot or chef’s pan, add everything and heat on medium-low. Stir well to incorporate all ingredients one time. Cover. Keep covered. After 20 minutes, remove from heat. Let stand 5 minutes. Fluff with a fork. Serve over greens. Garnish with olives. You can also make this in a rice cooker! One of the benefits of writing about food vs. reading about food: you get to eat the dish while writing about it rather than salivating over someone’s far away food pics in a fit of hunger. This is SO GOOD! Toss with the juice of 1 lemon, 1 tsp salt, and plenty of fresh ground black pepper. Pulse until creamy. 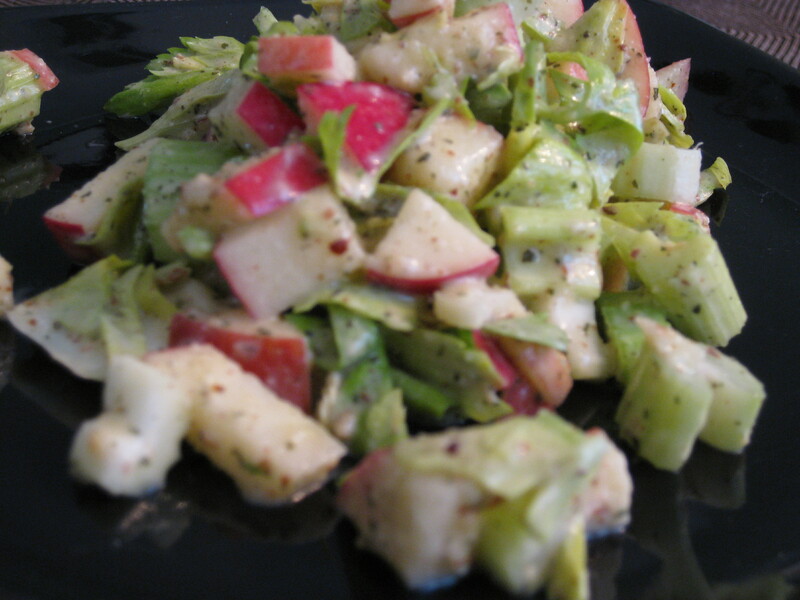 Toss with apples and celery. Can be chilled over night. Smoked almonds add a delicious zing if you prefer. To make a good salad add 3 yummy toppings to some lettuce: fruit, cheese, and nuts. Add some chopped meat for a high protein and filling meal salad. I like Applegate Farms smoked deli turkey for this. Dress with the juice of 2 fresh lemons, olive oil, salt, and pepper. Watermelon radishes are awesome. This sweet find came in my CSA box so I turned it into a salad topping to swoon over. Whisk together and sprinkle over salad. Serves 2 people like me. It’s cabbage season. 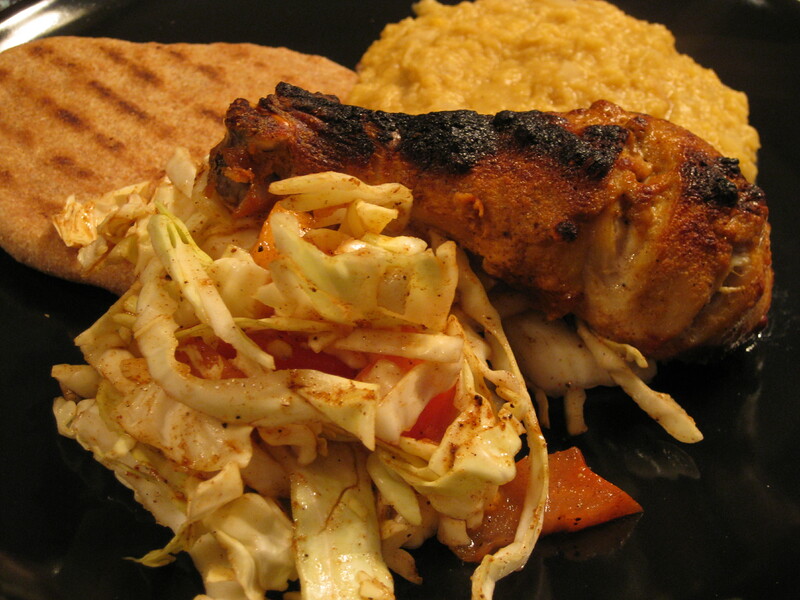 Here is something to do with it other than make traditional slaw. Toss all ingredients together in a large bowl. When dicing the tomatoes, transfer juices from cutting board to the salad bowl for added moisture. Coat cabbage well in seasoning and juices. Let rest in the fridge for at least 20 minutes before serving. This can be made up to 1 day in advance. This is a great salad year round. 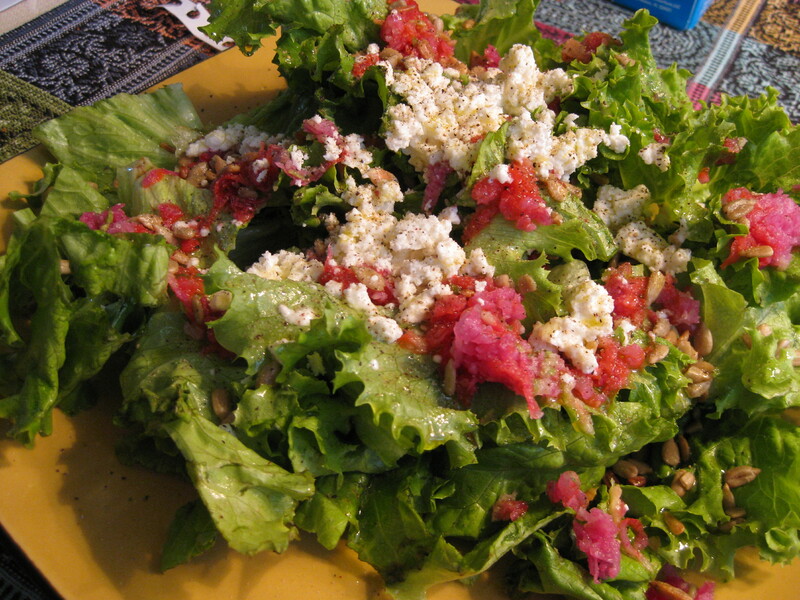 It is great served with grass fed beef or as a main dish salad for lunch. 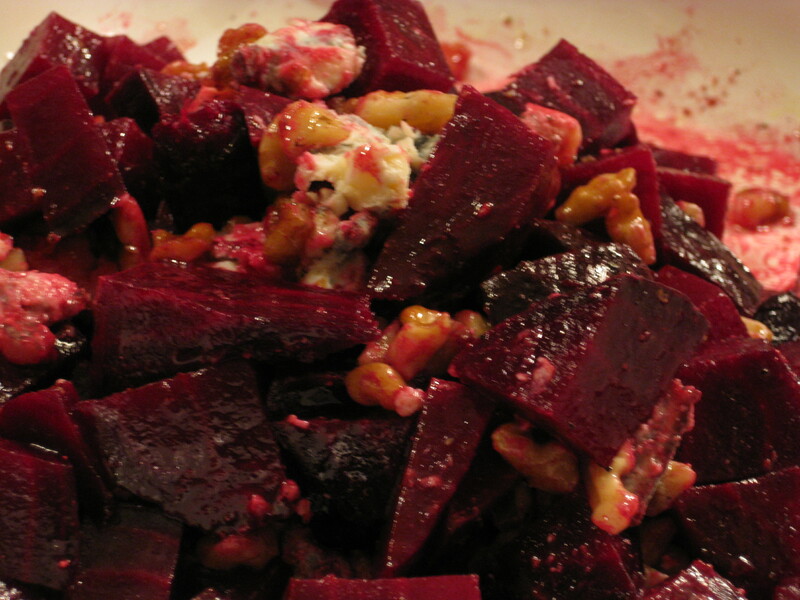 If you have canned beets yourself, not the pickled kind, they are fabulous prepared this way. Cut greens from beets and save for another dish. Beet greens are fabulous!! Rinse beets and place whole on a baking tray. Roast at 375 degrees F for 1 hour. Let cool to a temperature you can touch. Peel beets and cut into 1/2 inch cubes. You may want to wear gloves as beets stain. If you are using a wooden handled knife or a wooden or bamboo cutting board, they can easily get stained. Mix up vinaigrette in the bottom of your serving bowl. Add cubed beets. Toss to coat. Sprinkle over cheese crumbs and walnuts. Serve while beets are still warm. You can also make this salad ahead and serve chilled. It will last in the fridge for about 1 week. 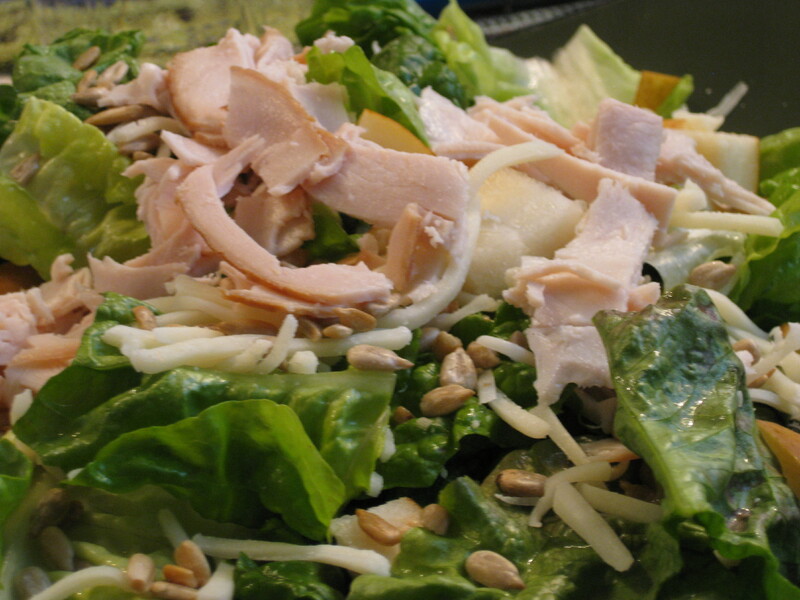 Make something fall-fresh with your leftover turkey– salad! Try serving this with butter lettuce. It is mild and crisp, making a perfect contrast to the rich flavor of roasted turkey. Also great as a wrap, cut and served as tea sandwiches, or dress up your after-holiday-party relish tray! 1 Cup shredded cheddar, Organic Valley is awesome! Mix dried herbs with vinegar and mayo/yogurt. Set aside while you chop the other ingredients. This will give the dressing time to develop its flavors. Toss chopped ingredients together and mix dressing in well. This can be served immediately or chilled. *** Double the dressing and toss in 1 lb cooked penne or gluten-free pasta for an awesome pasta salad. It seems a lot of the women I love are trying to cut calories. So, in full support of their hard work to get back the pre-baby bodies, here are some salad dressings. I don’t want you all being lazy and eating bottled crap full of fillers and synthetic food. Real food. Food with nutrition. Put all the ingredients in a jar (a reused olive or jam jar works well) and shake til uniform. This shaking can be done by your little kitchen helper. Kids like shaking stuff around all wild. Just make sure the lid is on tight. This will last in the fridge for about a week. This is very nice on a salad of chopped turkey, figs, almonds with spring mix greens. Again, into the jar and shake shake shake. This one will keep for weeks. Months in the fridge. This is very nice on Greek-style salads or greens topped with tuna, olives, and cucumbers… lil’ nicoise type action without the fatty eggs and mayo. Shake it in a jar. Keeps for a week. This is WAY lower in fat and is made with real food. Awesome on buffalo tempeh strips.